Similar anomalies include craniorachischisis, iniencephaly, encephalocele and microcephaly. Nova Scotia data were not available to CCASS before 1996. Québec does not contribute to the Discharge Abstract Database. Sources: CICH graphic created using data adapted from the following sources:1995 to 2000- Public Health Agency of Canada. Canadian Congenital Anomalies Surveillance System (CCASS), 1995–2004; Perinatal Health Indicators for Canada, 2008 http://www.phac-aspc.gc.ca/publicat/2008/cphr-rspc/pdf/cphr-rspc08-eng.pdf – accessed June 20, 2017; 2001 to 2010- Canadian Institute of Health Information (CIHI), Discharge Abstract Database. Perinatal Health Indicators for Canada, 2013 http://publications.gc.ca/collections/collection_2014/aspc-phac/HP7-1-2013-eng.pdf -accessed June 20, 2017. 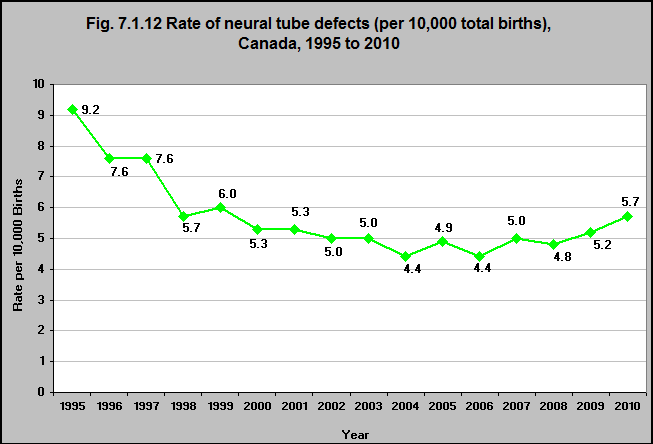 Between 1995 and 2010, the rate of neural tube defects in Canada decreased from 9.2 per 10,000 total births to 5.7. Most of the decline occurred between 1995 and 2004. The rate declined to 4.4 in 2004 then rose again to 5.7 in 2010. Neural tube defects happen in the first month of pregnancy, often before a woman even knows that she is pregnant. Much of the decline in the rate of neutral tube defects between 1995 and 2010 is attributed to policy-making and education initiatives surrounding the role of folic acid in preventing babies from developing neural tube defects.